Every now and then someone sends me a message that’s a real charmer. Here’s one I received at the end of last summer about a recipe that appears in my very first cookbook, Pasta Classica: The Art of Italian Pasta Cooking. The writer, Dr. John Brownlee, raved over it, as have so many other readers over three decades, so I’m sharing the message and recipe here. Because Pasta alla Destefanis is best made using vine-ripened cherry tomatoes, I decided to wait to re-publish the recipe, along with Dr. Brownlee’s message. This week, I plucked my first beautiful Sun Golds (the sweetest cherry tomatoes I know) from the vine in my vegetable garden to make this sensational and utterly simple dish. The pleasant and surprising recipe was given to me by Flavia Destefanis, my long-time friend who was born in Italy but grew up in many different countries, traveling wherever her father, a diplomat, was transferred every few years. 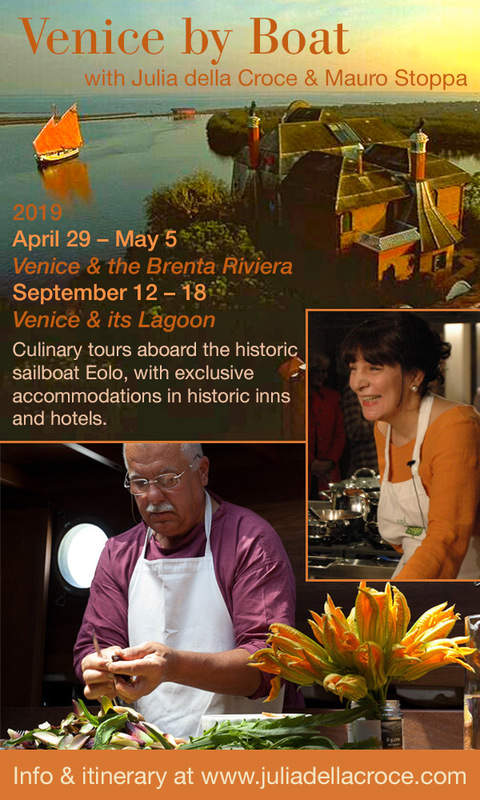 It made her think outside the box about food as much as most things, and she is good at combining the best Italian cooking traditions with ingredients considered exotic in Italian cooking. If you think the notion of an avocado and tomato sauce for hot pasta sounds odd, I can tell you that I have served it to many hundreds of people over the years, and delighted them all, every time—including the fussy school children I told you about. Recommended shapes include spaghetti or linguine, or short cut pasta such as “snails,” medium “shells,” pennette, or fusilli. If you don’t like the taste of raw garlic in your mouth, don’t use it; there will be plenty of flavor without it. When the avocado is tossed with the piping hot pasta, it clings to its porous surface and along with the olive oil, forms a creamy sauce. 1. Fill an ample pot with 5 quarts cold water and bring to a rapid boil. 2. 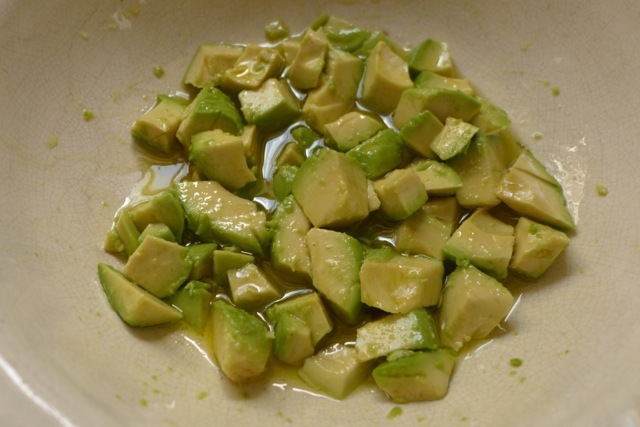 Peel and dice the avocado and toss it immediately with the olive oil in an ample serving bowl. 3. If using cherry tomatoes, slice them in quarters, or if they are very small, into halves. If using larger tomatoes, remove cores and slice and cut them into small dice. 4. 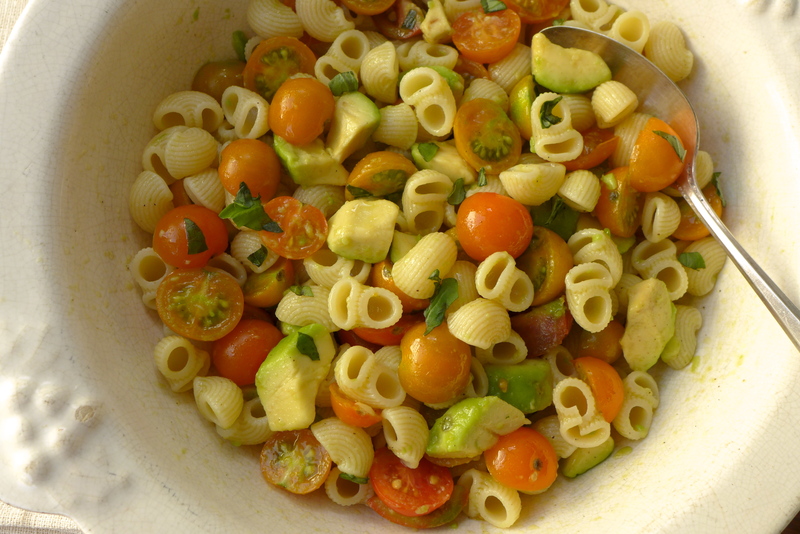 In the serving bowl, toss the tomatoes, garlic (if using), basil (if using), salt, and pepper. 5. To the pot of boiling water, add the kosher salt, followed by the pasta. Bring the water back to a rolling boil. Follow the pasta manufacturer’s cooking directions for “al dente,” stirring occasionally. Drain, reserving about 1/2 cup of the cooking water. 6. Immediately toss the hot pasta with the tomato and avocado sauce. Add a little of the reserved pasta water if necessary to moisten. Serve immediately. Coat the avocado dice in the olive oil first to prevent it from turning dark. 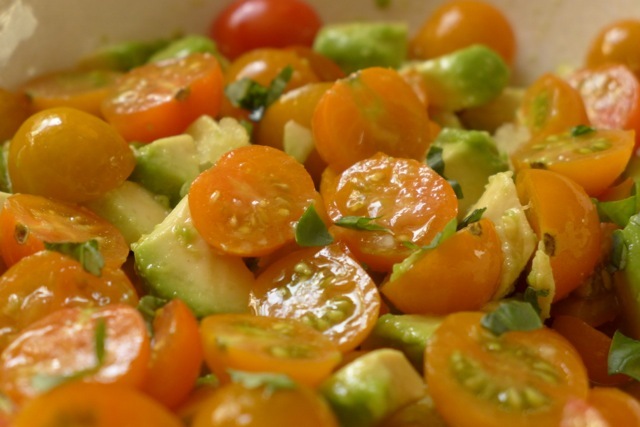 Toss the cut-up or diced tomatoes with the avocado and other ingredients. 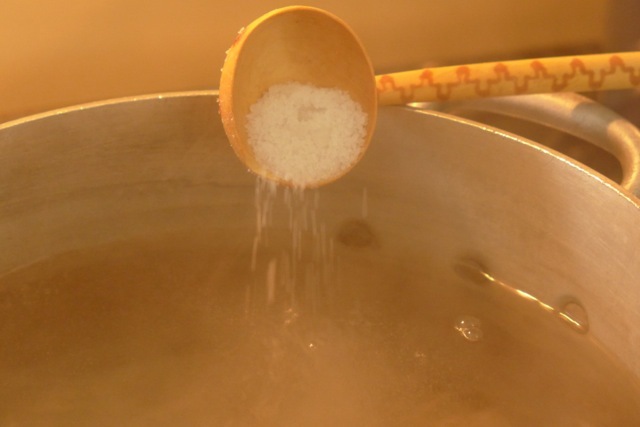 Add coarse salt to the boiling water without skimping—you need 2-3 tablespoons for 5 quarts of water. The tomatoes in your garden look lovely! The pasta does too. I wish that you would have implemented a healthy food program at my elementary school. This pasta dish beats pizza dippers any day. Bob Gruber, so do I, you would have been one of my star eaters. My consolation: I get to cook for you now! What an absolutely lovely letter from Dr. Brownlee. It must warm your heart to receive such missives. I am saddened, but not particularly surprised, by the reaction to your own children’s school lunch program. My, but those kids really missed out on some wonderful food. What a pity that those parents refused to avail themselves of your knowledge. You book Pasta Classica is one of the first cookbooks I bought “way back when” I decided I wanted “to learn to really cook.” The book is a treasure indeed, and I have referred to it countles times over the years. I love the idea of the avocado and fresh tomato sauce. The avocado imparts its unique creaminess, making for a wonderful condimento. And I don’t have to go into the Sun golds again. Aren’t they just the best? As I mentioned the other day, we are remodeling our home, and we are now in a rental home. 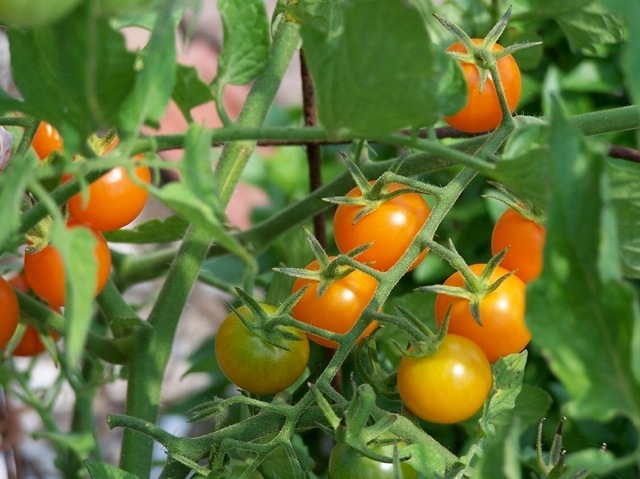 I planted just a tiny garden this year, but the Sun Golds are there, ripe now for the picking. Thank you for this, Adri. I feel like I know you! I am so happy to hear that even with all the upheaval you have been experiencing, you still managed to plant the most heavenly tomatoes on earth! I’m wondering if you aren’t thinking of our friend, Adri Barr-Crocetti?… Not that I’ve been exempt from upheaval myself lately! Bless your heart, Phyllis. I do hope we’ll get to meet in person one of these days! Julia it also saddens me to hear about the “lost” school programme…what the heck are parents thinking don’t they read or haven’t they heard the statistics on diabetes, heart disease on so on!!! They just need to look around to see what’s been happening to our diets!! I remember seeing a Jamie Oliver T.V. show about his trying to implement healthy eating programmes in schools in the States…it seemed as though some parents would have loved to tar and feather him, then run him out of town!!! What in the world is going on?? As Adri said, it must be lovely to receive such kudos for making a great attempt and here’s hoping that at least some of your teachings stuck! 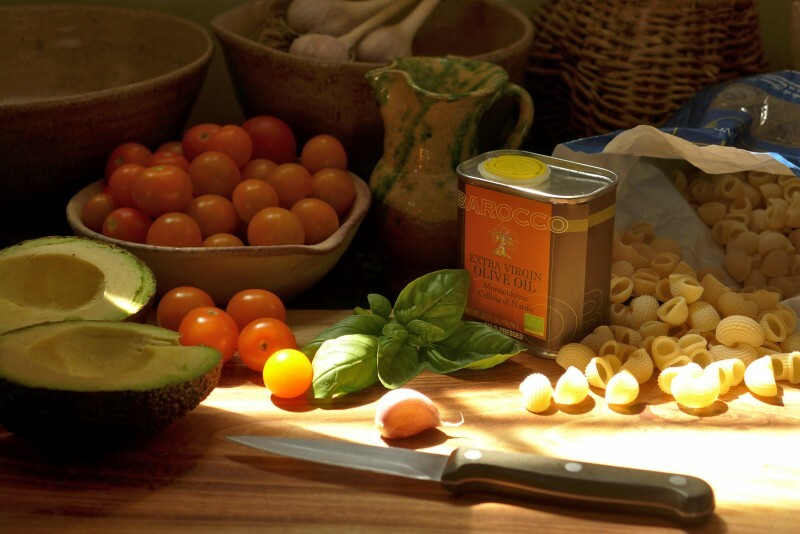 BTW…my Sun Golds are coming along rather nicely…time to make this simple but luscious sounding pasta! That happened seven years ago—before Jamie Oliver’s similar experiment—and I’m still at a loss to understand it fully. I can tell you, though, that the parents in question had bad eating habits themselves, and they fed their kids the way they ate. This crowd would have loved to tar and feather me, and they did metaphorically. And yes, they actually did “run [me] out of town”— get me fired, that is. I know it’s hard to imagine!